The projec t will produce a new district of up to 8,000 homes, 25% of which will be offered at below-market rates, extensive open spaces, three hotels, restaurants, retail, and entertainment venues within San Francisco. The project’s design draws heavily upon the natural setting and features of the islands – sun, wind, views both of and from the islands, shore lines, topography, soils, habitat, and vegetation – and features intentional contrasts that will add interest for all who live on or visit the islands. Expansive parkland will lie alongside compact urban development; panoramic vistas will be juxtaposed with intimate neighborhood streets and parks; regional transportation infrastructure will serve an island best known for small scale pedestrian- and cyclist-oriented local streets. The dramatic steep slopes, natural vegetation and limited construction zones of Yerba Buena Island will contrast with the human-made, flat canvas of Treasure Island, where San Francisco can build a great new place, essentially from scratch, in the middle of the metropolis. 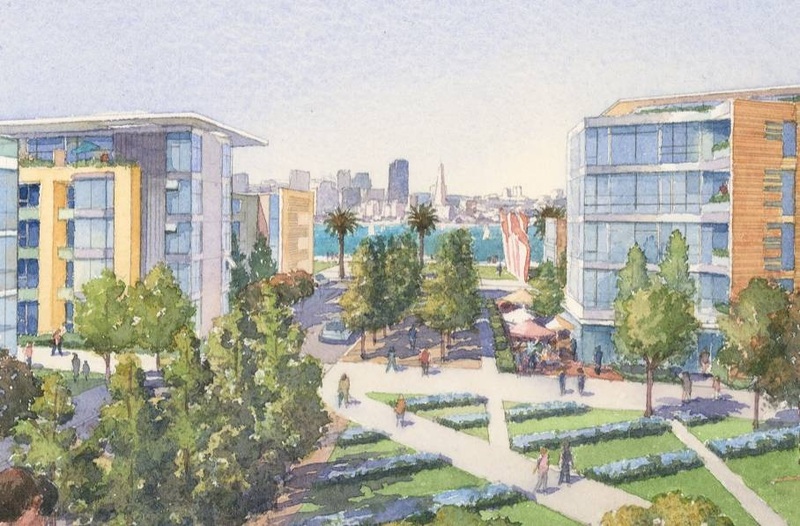 Arranged on a series of fine grained, walkable blocks, the new homes on Treasure Island will form two neighborhoods – one along the island’s western edge with spectacular views back to the City, and a second stretching to the east along Clipper Cove with views of the new Bay Bridge and the East Bay hills. Each neighborhood will feature a distinctive mix of parks, and both will be enveloped by a regional waterfront park system that will occupy the majority of land on the island. These east and west neighborhoods will share a retail main street linking the historic buildings along Clipper Cove to a west-facing ferry and bus terminal, while creating a regional destination and social heart for this new district of San Francisco. The conventional street grid rotated 35 degrees to orient streets southerly to maximize sun in neighborhoods and parks. Wind channels are mitigated by angling the secondary street grid. Streets and buildings are oriented to maximize the effects of sun and minimize the impacts of wind. The project’s design grows out of Treasure and Yerba Buena Islands’ remarkable natural setting and rich history. It is oriented around a progressive design philosophy reflecting San Francisco’s commitment to sustainability and will ensure that the islands enter San Francisco’s family of world class neighborhoods, using an innovative design that embodies the City’s most desirable characteristics: walkable, compact and eclectic; economically, ethnically, and demographically diverse; sensitive to topography, views and aesthetics; memorable and distinctive.